Tide Pool: Home for the Holidays! So I realize it's been a full semester since I've posted, and that, friends, is WAY too long! 16 credit hours and a job three days a week turns into very little extra time. But the good news is I'm back, and just in time for some delightful holiday postings! So first of all, I am SO excited for Christmas. I'm a Christmas kind of gal, and once the season is here, I'm all about the ho ho ho and the mistletoe. So even though I'm a Florida gal, my heart goes back West when it's time to snuggle down and remember blizzards and hot coco and cold starry nights of Christmases past. While I think Santa Dolphin is as cute as anyone, I think temperatures need to make you shiver a little and wish for snow to make the holiday season really kick in. My mom likes to crank down the AC and pretend it's cold outside too, and if it gets below 60 we break out the fire pit. But cold rain and wreaths on our palm trees only go so far, and, let's face it, an 80 degree Christmas morn listening to Jimmy Buffet doesn't really do the trick. So since I know that most of us can't buy a ticket north, here are some things that I like to do to keep a winter christmas state of mind, even if you come from the land of cotton. 1.) DO crank down the AC. Having to put on socks and cuddle under a blanket is, I think, one of the best ways to get in the Christmas Spirit. 2.) GO ice skating. Brr! you have to bundle up and there's one in almost every city. Sometimes they play christmas music and, while it isn't Rockefeller center, it's still a wonderful thing to do around the holidays. Your nose even gets cold. Plus, how cute is it as a date idea? 3. )DON'T put snow men or the like on your green green lawn. It just looks, well, tacky. It's honestly pushing it when there IS snow, and when there's flowers blooming next to Frosty, it's time to rethink. 4.) DO put greenery all over your house. It smells wonderful, and with a lighted candle and some music, it doesn't matter if you are in Montana or Miami; it's a timeless tradition that works in all weather. tropical Christmas as best you can. Rejoice in the fact that you don't have to worry about snow in your boot, or shoveling the driveway, or running out of firewood. 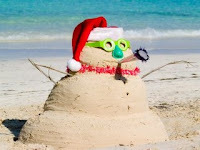 And, let's be honest, going to the beach ( and swimming) the day after Christmas is pretty cool.